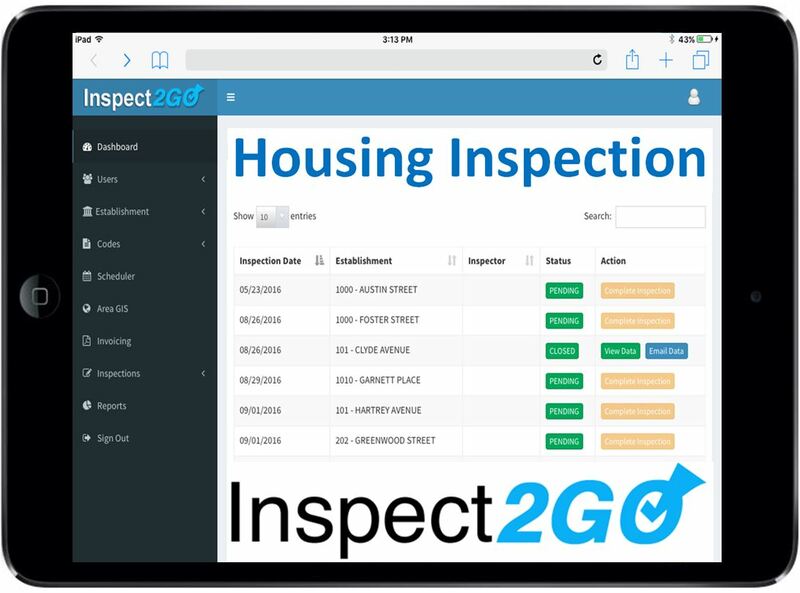 Inspect2GO offers residential property inspection solutions designed specifically for city inspectors. Use the offline-capable mobile app to inspect housing, apartments and other multi-unit properties. Email PDF inspection reports while on location, with signatures and photos. Use the cloud-based management software to enter building and housing codes, schedule inspections, track violations and manage properties. Contact Inspect2GO to schedule a demonstration. Offline - Offline capable, native app for field Inspection. The inspection report can be emailed as a pdf while in the field and includes inspector ID, location, person-in-charge, violations, corrective actions and a time table for each correction. The report is tailored to look consistent with City/County checklists.